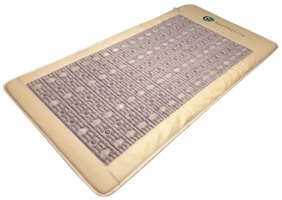 Luxuriate in the natural healing benefits of the InfraMat LargeMat-012AJT. This full-size body mat produces therapy for the entire body. The mat contains several pounds of healing stones–amethyst, jade, and tourmaline. Each of these stones produces various benefits for the body, and when combined the result is a relaxing detoxification and health enhancement, both mentally and physically. This state-of-the-art mat provides the user with adjustable heat control on an LED display. The heat from this mat will penetrate into the muscles, tissues, and bones in a relaxing and edifying manner. The heat improves circulation of the blood, relieves unnecessary stress, and flushes the body of toxins. Further, implementing heat into the body creates a relaxing, calming state of being, which promotes positive mental health. The InfraMat LargeMat-012AJT produces a high output of negative ions that function as an instigator of various positive biochemical reactions in the body, which boost cellular metabolism, counteract free radicals, and increase or maintain overall physical health. Further, it aids in weight loss and promotes normal function of the nervous system. Not only will this mat improve the overall function of your body, but your mind will also feel healthier! The combination of stones promotes mental health. Specifically, the stones decrease feelings of anxiety and alleviate feelings of depression. This incredible mat not only provides various mental and physical benefits but also has an added bonus of being lightweight and compact. This unique mat is ideal for traveling, as it will easily fit into travel bags. Imagine being able to carry health and comfort with you when you travel! The compact nature of the mat also allows for easy storage with minimal effort. The InfraMat LargeMat-012AJT is a large, wide, full-body mat. It measures 25 inches and consequently provides therapy for all areas of the human body. This mat is ideal for any body shape or size. The wide nature of this mat makes it ideal for covering the body with inherent healing properties. Guarantee yourself positive healing benefits of this luxurious mat by ordering one today! The very fibers and stones of this mat have been developed with your comfort and health in mind. Create a circle of healing within your reach by ordering a mat today for your friends and family.